My machine, Creation Station work area of 24" x 24" x 5". Bought it from a KickStarter campaign. Was a kit but I did build the kit. Have already modified it some, better table, more LED lights and dust system. Built it over a year ago but did not have the right place to fire it up. Creates too much dust for a garage setting with normal household storage. Bought a 8x12 shed and put it in there, fully insulated with a full house vac system with added dust cyclone for dust control. Dog bed under mill is for my boxer, cannot go out there without her on my heals. Added a webcam so I can keep an eye on the long jobs. Happy with it and loving the Vcarve Pro 8!! Nice build there. Now, get onto the important stuff, like your dog pics! My orange beast, the Grunblau. Still learning this new hobby and loving every minute of it! CNCArchitect wrote: My orange beast, the Grunblau. Love the ingenuity of using a toolbox as a monitor and keyboard holder! 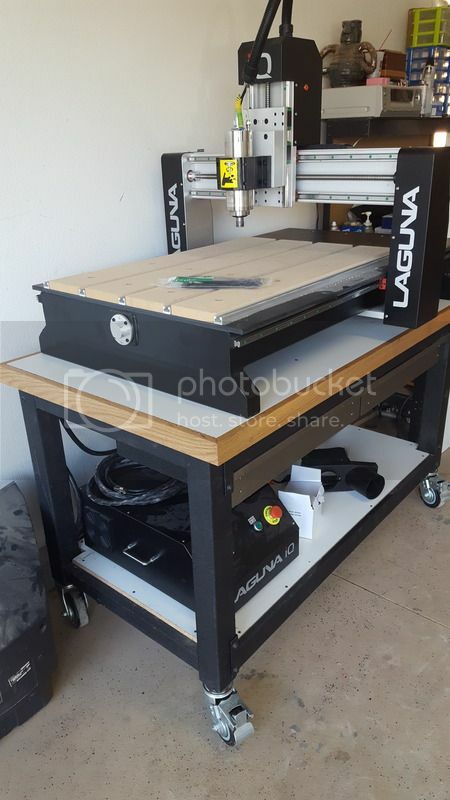 Here's a few shots of my Homebuilt CNC router and cabinet. The design is loosely based on the Fineline Automation design using 8020 aluminum extrusion, except using v-bearings for the rails. It hosts a Hitachi router with SuperPID for controlling spindle speed via Mach3 CNC controller software. I really enjoy seeing the variety of machines that people are using! Here is my home built CNC. I googled a lot of DIY machines for inspiration, then started designing on my whiteboard. I bought the largest slides I could afford, then designed around those. Everything else is DIY in my garage. I do have a small Harbor Freight mill that I turned into a CNC machine, which allowed me to do the aluminum for the Z axis. I hope over the winter to design up some additional changes to give me a bit more room on the X. Currently I get approximately 42 X 35 Y size movement. I cannot use all of that with Vectric Vcarve Desktop 8.5 due to the 24 x 24 limitation, but I am studying the "tiling" feature to expand my reach. I use a laptop and UCCNC-100 with Windows 10 to run MACH3 after I design in Vcarve Desktop (which I am still learning as I upgraded from Cut2d). Great job on the home-built. Really, really think about making a dust shoe as one of your next projects--your lungs will thank you. Mike-S - I am working on a good dust shoe now, I currently have a wrap around piece of a leather apron that is usually on there, but took it off for the photos. This is my machine ... Designed and built it myself after checking out many different versions online. - Control: Windows 10 > MACH 4 > USB to PMDX-422 > TB6560 - 3 Nema23 (270 oz-in) Stepper Motors > 2:1 Reduction to RM1602 Ball Screws. Works great, I learn new tricks/methods every time I do a project. Just got "VCarve Desktop" and learning even more. Nice machine. Nice bank you are assembling as well. JickyJay, you machine looks great! I like to wiring and the electronics "bay" beside it. Just got my machine up and running last night. Bought in Dec. Can't wait to figure out how to use it. I am new to the forum. I live in Milwaukee, Wisconsin and have attended several Rockler Shark user meetings. My first machine was a Piranha and have recently assembled a Gryphon. The Gryphon has a 36 inch square carving area. This is the Old Gal. She isnt the prettiest but she is a workhorse, and wont stray. 1999 SCM Record 120s, w/10 tool changer and vacuum table. She mills at a max of 132ft/min and rapid is 142ft/min. It takes 10,000 + lbs of cast iron to keep her steady. This old machine like many others of the same vintage are PLC based. Super robust, with lots of fail safes to keep me from screwing too badly. Along with the pictures I have been turning out cabnites, still getting used to the potential of the machine. The chair back is 24x30 the bed of the table is 34"x119"
My machine is a Red Sail 1313 used only for 5mm thick polypropylene with sheet size 1m x 1m. I cut parts to make dog boxes for cars - sides, floor, roof, and weld it all together.